Though Mattel's Barbie was the 'it' doll that revolutionized the doll world, she's not the only one out there with a rich history. The internet is globally bursting with information of how other fashion dolls came to be and where they are today. I'd been trotting around the net, checking out other dolls beyond the Mattel and Integrity Toys line just for a different pace on things. After a while, seeing the same topic on different blogs can be a bit repetitive. I'm most likely behind on things but I just discovered a Korean fashion doll named Mimi and she looked like a copy of Takara's Jenny. Apparently she's been around for 30 years. I found it on THIS article. Very fascinating. Anyway, I had a hankering to play with my less curvaceous and mature dolls. It's been a while since I've shown appreciation to my Takara dolls. Now that I'm putting my Takara Jennys side by side, I can see some slight differences in the two. I don't know their manufacturing dates. I'm going to take a guess that they were roughly a decade apart. School uniform Jenny's complexion is not as pink. I'm not sure if it's because she's older or her formula was different but she came to me with that skintone and her color's been that way since I got her. Her head is also slightly smaller. I think I like her better than the newer Jenny. Although they're both super cute. 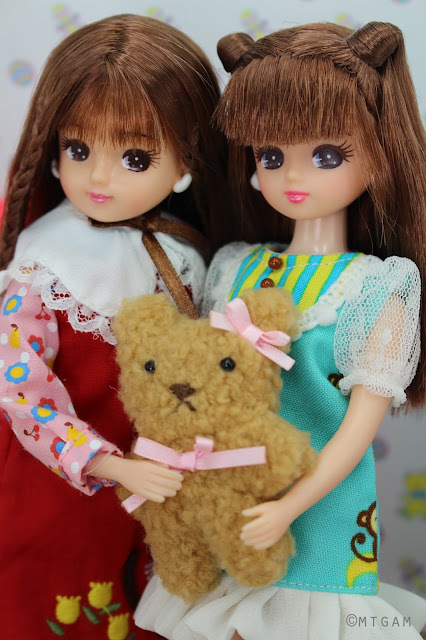 My Licca-chan dolls were both originally in school uniforms as seen HERE. Interestingly, the one with the side braids has a head that only turns from side to side while the pigtailed one has a wider range of head motion. I suspect their manufacture dates were also different despite the identical outfits. I think I kinda understand why Licca's more popular than Jenny in Japan. Jenny's older so imaginative play with her seems to be stuck on a late teen fantasy of looking trendy in the latest fashions while Licca has a childish innocence about her when sky's the limit to what she can dream about. I certainly had more fun posing my Licca dolls around than Jenny.